Northwood University in Midland, Mich., was scheduled to present seven Dealer Education Awards at a breakfast Sunday, Feb. 6, in conjunction with the National Automobile Dealers Association convention. -- Lee Certilman of Nardy Honda in St. James, N.Y.
-- David Kring of Dave Kring Chevrolet-Cadillac in Petoskey, Mich.
-- William Perkins of Bill Perkins Automotive Group in Eastpointe, Mich.
-- John Symes of Symes Automotive Group in Pasadena, Calif.
-- Samuel Weaver Jr. of Chevy Chase Automotive in Bethesda, Md. The members of the Greater Cincinnati Automobile Dealers Association elected officers. 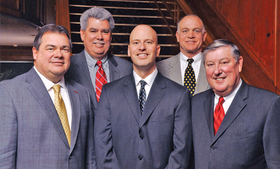 Pictured, from left, are Larry Feldhaus of Lincoln of Kings Automall, immediate past president; Bob Huser of Fairfield Lincoln-Volkswagen, secretary/treasurer; Joshua Sweeney of Jake Sweeney Automotive, president; Ken Falhaber of Falhaber Nissan, vice president; and Ace Ammann, the association's executive vice president. Fairfield Lincoln-Volkswagen is in Fairfield; the others are in Cincinnati.